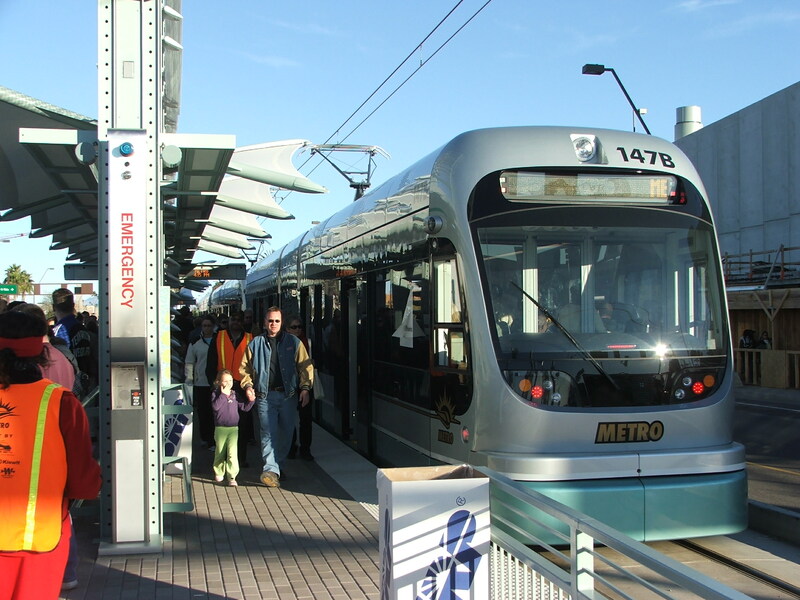 Phoenix was home to the largest light rail launch in U.S. history when it introduced the 20 mile, 28 station, $1.4 billion mass transit sytem to valley residents today. 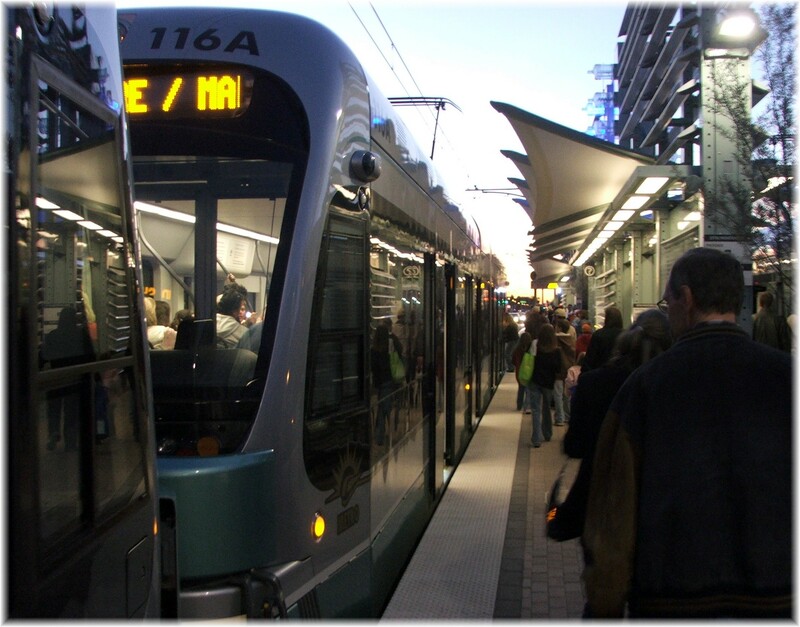 There is no charge to ride the light rail for the rest of 2008. Tens of thousands of people took advantage of the free fare to see what 12 years of planning, research and construction had to offer. I would not be surprised to learn there were over 100,000 passengers the opening day. I thought that if I was going to write about it, I’d better experience it. My initial stop was to the eastern most station at Main and Sycamore. That quickly changed when they quoted a wait time of 1.5 hours to get on the train. Only three stations away was the McClintock Dr. station where there were no grand opening festivities, so I assumed the wait time would be less, which it was. The challenge was finding space since very few riders were exiting. After watching two trains go by I became bolder and carved out my 2’x2′ of standing room and joined the thousands upon thousands of Phoenicians that just had to be there on opening day. The total length is 20 miles which takes 60 minutes. The daily schedule begins at 4:40 a.m. each morning at each end. The last trip begins at 11:00 p.m. arriving at the opposite end at midnight. The trains will run every 10 minutes from 6 a.m. to 7 p.m. and every 20 minutes the rest of the day. My recommendation for anyone wanting to experience the newest mass transit in Phoenix would be to return in January and pay the $2.50 all day pass /unlimited boarding fare and enjoy the ride. The light rail seems to be the perfect solution for those wanting to have quick and easy access to the Mill Ave. part of Tempe, but were worried about the traffic and parking. 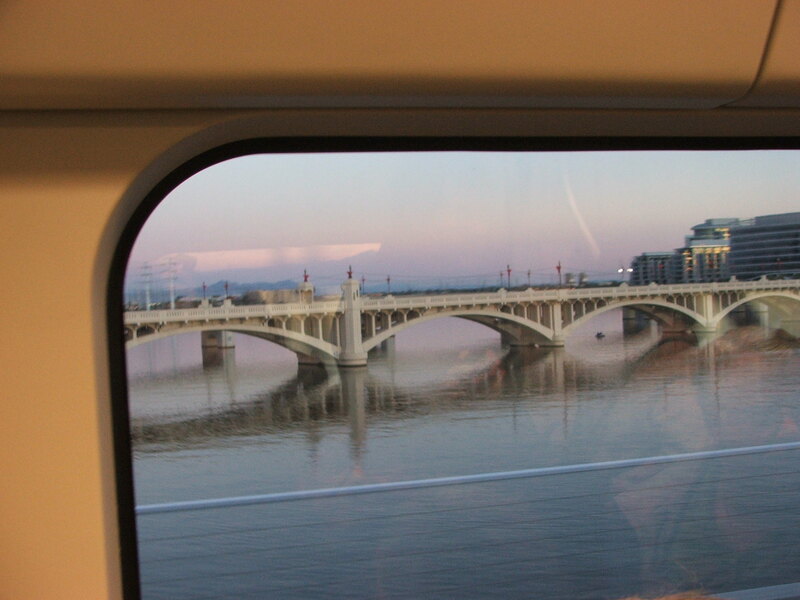 There were at least 3 stops on the ASU campus, and a nice ride over Tempe Town Lake, pictured on the left. I got off at the Center Parkway station and caught one of the trains returning east. I’m looking forward to making the full round trip when I can enjoy a window seat, and there is not standing room only. My initail impression is that the light rail system is long over due and will have a positive impact on the valley. Being the 5th largest metropolitan city in the U.S., it is only fitting that Phoenix takes a positive step towards mass transit.